Art inspiration is an important thing – to be able to see the light in everything that surrounds you, to know how to transform your impressions and thoughts into the graphics and visual forms it’s a quite a great and valuable gift. A gift that needs a lot of hard work and desire to keep a creative mind under control, generating new ideas, expanding the vision and reaching out every art goal. Some artists are a non-stop stream of concepts, imaginations, and ideas. But even they confess that they have a favorite method to illuminate their way if the creative crisis appears in front of them. They know very well what to do, and even have some tricks on how to overcome the crisis. Other words they know very well where to find a muse. Generally talking the artists searching for an afflatus do many things. Most of the digital illustrators or traditional artists whatever who they are the beginners or a Pro love art books. Almost every master has an inspiring person whose life was or still is memorable. Almost every master has an inspiring person whose life was or still is memorable. A person whose legendary artworks have a deep influence on their work and life, sometimes. Artworks that have become iconic for ages. The stories of those greatest artists you can find in the best art books. Ask yourself who is your great inspiration? Do you have an answer? I am sure you have a few names in your head. But it’s time to discover something new and I have a few names to get you familiar. If you still don’t have your small art library it’s pretty much a great time to start expanding the horizons of your creative mind and put some comprehensive art books on your shelf. Communicating with artists one of my favorite questions is: What inspires you the most? You know what, I have got quite a great collection of answers. They are very different, very valuable and very interesting. Considering all of them, I have got a list of useful art resources for you. The books that can come in handy if you are looking for inspiration and will help you to find helpful answers to many of your questions. Those art books are available online, you can easily buy or download them to your smartphone or Kindle. It does not matter who you are a beginner or a pro, does not matter what technics do you use to create. Those best art books are about art, artists are great to read and get a fabulous inspiration to create. How to be an Illustrator Paperback by Darrel Rees. Readers found this book very helpful. Since the business of illustration relies so much on self-promotion, it’s good to have tips on how to bolster your portfolio, articulate your strengths, and navigate the industry. If you are a recent or soon-to-be graduate, this is a fantastic book to build your confidence for job interviews. International illustrators are interviewed, discussing how they got their break in the industry, their experiences with clients, their methods of promoting work, and more. In addition, leading art directors to describe their approach to commissioning illustration, how they spot new talent, their thoughts on promotional material, and their advice to up-and-coming illustrators. Ever since its first publication, this book – with its subsequent revised and augmented editions – has been considered a classic of its kind, and that reputation has become worldwide. A fascinating art related book. Readers say that they did not expect Bacon to be so open and Frank about his own work. There were obviously very few people Bacon would consider worth speaking to in depth about his art. David Sylvester was one of those sufficient persons to talk with. This Book has was suggested by a great digital illustrator Carlos Alberto Salvá. He says that the artworks of the painter Boris Vallejo and his wife Julie Bell have inspired him a lot until today. 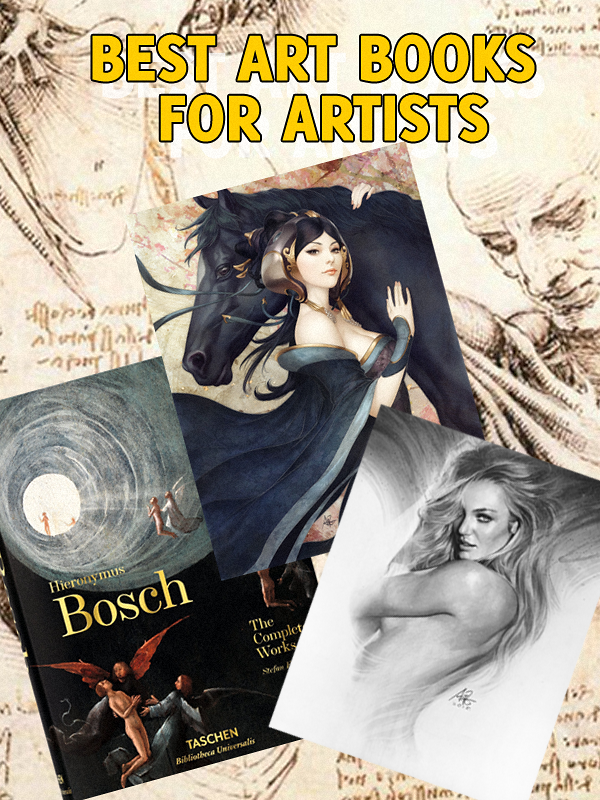 Amazing book for all the fans of fantasy art. One of the best fantasy artists is Boris Vallejo. This volume is one of his early fantasy art books. Even though this collection came out more than thirty years ago, the sensual beauty of his paintings truly come to life and reveal what a genius the man is when it comes to this kind of art. Art critic and scholar Philippe Dagen approaches Picasso as a subject through a series of questions. What does it mean to be an artist in the twentieth century? A comprehensive book on Picasso’s work to add to your art book collection. This book has comprehensive content across the changing modalities of Picasso’s work throughout his life. The reproductions are magnificent but then this is the norm for any book published by the Monacelli Press. The analyses by Phillippe Dagen is approachable, illuminating, and not overly dense for the beginner art lover. The book for those who are interested in the topic of New Objectivity and likes the paintings of Otto Dix. This book can tell you a lot about the history and the artists. “The Neue Sachlichkeit: I invented it.” Thus Otto Dix (1891–1969), looking back with characteristic directness, chose to rewrite the development of the art movement that can be considered the “third path”–alongside Abstraction and Expressionism–taken by progressive artists in the modern era. Beckmann Hardcover by Reinhard Spieler. The book about one of the greatest German painters of the 20th century. The book is Richly illustrated and filled with detailed information about one of the leading artists of the 20th century. The book is very attractive. There are many close-ups of details, for those who have not seen any of the original paintings. You can see the accuracy of color and texture. There is quite a wide margin of white around each artwork. It is a great book for all the lovers of the paintings. You will be glad to have the book in your home art library. Goya: Order & Disorder by Stephanie Stepanek. This book paints an interesting portrait of Goya in his contradictory roles – Goya the court painter to four successive monarchs, Goya the subversive social critic, Goya the satirist of human folly and superstition, and Goya the master of fantasy. When his fame was firmly established, Goya declared that “There are no rules in painting.” He thought of himself as an “inventor” and felt that the traditional academic program for training artists stifled their creativity. The book is about an incredible artist Hieronymus Bosch. Considering the era when he was painting his work is confounding, disturbing, far ahead of his time and extremely detailed. The narrative of the book is very detailed. Great starter if you are interested in his work. Only 20 paintings and eight drawings are confidently assigned to Netherlandish painter Hieronymus Bosch (c. 1450—1516) but in their fantastical visions, they have secured his place as one of the most cult artists in history. 500 years on from his death, his works continue to inspire scholars, artists, designers, and musicians, death metal band names and designer dresses. For those who are interested in Da Vinci’s work, this is an excellent record and concisely portrays the amazing mental processes he used for his brilliant work for his entire life.